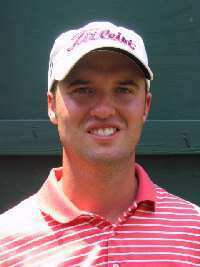 SPRING LAKE, N.C. -- Jason Martin of Lenoir grabbed his first professional win Thursday in the Tarheel Tour's Anderson Creek Open at Anderson Creek Golf Club. Martin, a former All-Conference golfer at UNC Greensboro, shot a final-round 71 to finish at six-under 210 and take home the $9,000 first-place check. After four second-place finishes on the Tarheel Tour over the last two years, Martin was pleased to taste victory. "I know I'm good enough, I just had to prove it to myself again," said Martin, the 1998 North Carolina Amateur champion. "Hopefully this will be my breakthrough and I can keep going from here." Martin overcame tough course conditions on a day when only eight golfers broke par. He passed second-round leader Kevin Taylor of Mocksville on the 16th hole and held off a charge from two former N.C. State standouts -- Garth Mulroy of Raleigh and Fernando Mechereffe of Charlotte. "I played pretty solid and had a really good save for par on No. 17," Martin said. "I hit my irons well and putted well this week. I don't think I three-putted once." Mulroy shot the day's low round, a 69, to move into second place at 211 with Mechereffe (70) and Taylor (75). Each earned $3,433.33. Two more N.C. State alumni -- Jason Moon and David Sanchez -- tied for fifth at 212, taking home $1,825 apiece, while David Seawell of Columbia, S.C., and Rich Hanna of Stanardsville, Va., tied for seventh at 213 and won $1,300 each. For Martin, who plays out of Treyburn Country Club in Durham, it was first win since college. He credited his association with Treyburn for helping him develop, and said he hopes the tour returns to Anderson Creek next season so he can defend. "I'd like to thank the staff and the members at Treyburn for all their help the last two years," said Martin. "And I hope we come back here to Anderson Creek next year. I like the big greens and all the undulation. The golf course sets up really good for me." Next up for the Tarheel Tour is the Charlotte National Open, July 6-8 at Charlotte National Golf Club in Indian Trail, N.C.